A preview of Demo Day at ABN AMRO, getting our top 11 ready for Demo Day itself! Organized together with the MeesPierson Private Wealth Management Section of the ABN AMRO bank, the Demo Day Preview allows the 11 Startupbootcamp Amsterdam 2014 startups to present themselves for an audience of investors, family, friends & acquaintances of the startups. After being selected from over 700+ applications, our top 11 teams began their acceleration journey on the 31st March here in the heart of the Netherlands. The 11 teams, from 6 different countries, left their lives, families and friends behind to board a plane here to Amsterdam. Guided by our team of top-level mentors, they have worked incredibly hard to become world class companies and make their footbprint in the world. After 3 months of blood, sweat, and tears they’ll be ready; on Demo Day (25.06.2014) they will pitch their companies to an audience of VCs, Angels, and Seed Investors. At the Demo Day Preview they will give a selected few a sneak peak to theyre long and inspiring journey these past 3 months. 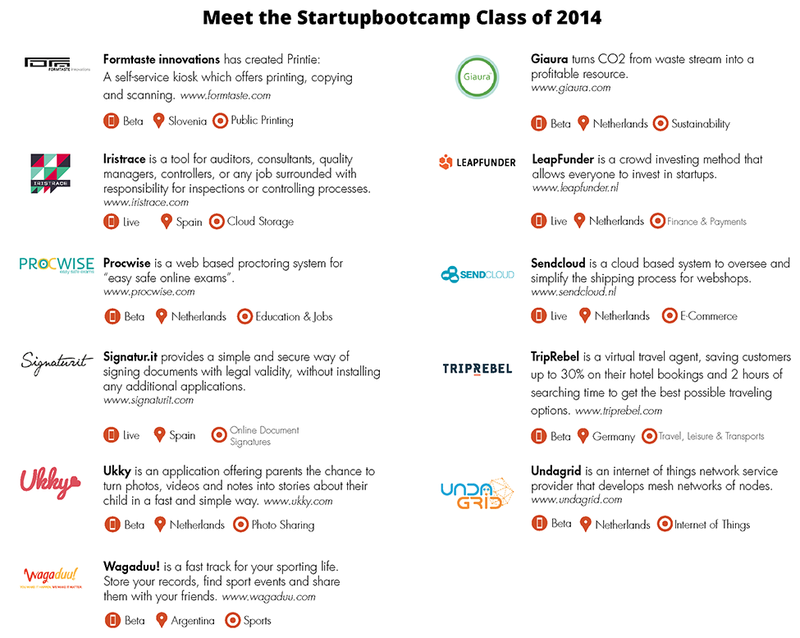 We proudly present the Startupbootcamp Amsterdam Class of 2014! Demo Day Preview will take place at the ABN AMRO Headquarters – Gustav Mahlerlaan 10 in Amsterdam. The entrance is at the Gustav Mahlerplein. Click here to see the map. The easiest way to get to the Demo Day Preview is by public transportation. The ABN AMRO Headquarters is situated right next to the Amsterdam Zuid/WTC station. It can be reached by train, tram, subway and bus. The ABN AMRO Headquarters is situated in Amsterdam-Buitenveldert to the south of the A10-Zuid ring road between exits s108 and s109. There is a Q-park parking garage located next to the event location. The address of Q-Park ‘Symphony’ is: Leo Smitstraat 4, 1082 MP, Amsterdam. In some navigation systems this address doesn’t work, in which case use Gustav Mahlerlaan 10.